It’s been too long since I last posted. I marvel at bloggers who are constantly connected and constantly conversing with the rest of us. All I can figure is that they have more hours in their days than the paltry twenty-four I get. The goal of my previous post was not to take sides in the dispute, but to take issue with critics who insist that academic freedom can’t exist in a confessional community. For me, joining the Wheaton faculty in 2010 after twenty-two years at the University of Washington was a profoundly liberating experience. Day after day, I enjoy a degree of freedom in the classroom here that far exceeds what I knew at UW. And day after day, the freedom that I feel here thrills my heart and nourishes my soul. So where does this leave us? I observed that I feel greater academic freedom at Wheaton than I experienced at my previous secular institution. Steve replied in so many words, “No, you don’t.” Wheaton may be a “good fit” for me, but what I’m experiencing here can’t be true academic freedom because, as he understands it, academic freedom can’t exist here. Maybe we need to take Becker’s advice and revisit what we mean by “academic freedom.” What we cannot mean by the phrase is the liberty publicly to explore, espouse, and promote any conceivable value or set of values as an employee of an academic institution. Such a definition would be utterly useless, for I know of no place where it exists. The unsubstantiated, near universal assumption suffusing the present controversy is the fiction that secular schools erect no boundaries to academic expression. When Steve says that secular universities “do not require people to hold a certain perspective,” I don’t begin to know how to respond. I could quickly tick off a long list of conservative political or moral positions that are unacceptable across a broad swath of today’s secular Academy. There are countless positions which, if not kept private, would effectively preclude those who hold them from promotion and tenure, or even the possibility of employment to begin with. There’s no need to make such a list, however, because one simple example will suffice. Today’s secular Academy insists that faculty adhere, at least publicly, to a materialist, rationalist world view. Its credo, to quote atheist Matthew Stewart, is that “there is nothing outside the world that may explain anything within it.” In theory, at least, faculty are utterly “free” to pursue truth wherever it leads, as long as they do nothing to challenge this a priori answer to the most fundamental of all human questions. Imagine a tenured professor of history at a public university who announces, “After much study and reflection I have come to believe that the Incarnation of Jesus Christ holds the full meaning of historical experience, and henceforth I will teach all my classes from that point of view.” Would the university’s declared commitment to academic freedom allow him to keep his job? No, because he will be said to have violated one of the core principles of that particular academic community, which is to bracket questions of religious belief rather than advocate for a particular religious view. I would add to Jacobs’ example that if the hypothetical public university in question ousted this trouble-maker, it would deny that it had infringed on his academic freedom. If this looks like hypocrisy to an objective bystander, technically it’s not. This is because when the twenty-first century university speaks of freedom, it really has in mind a concept closer to the seventeenth and eighteenth-century meaning of liberty. Three centuries ago, liberty meant the freedom to behave uprightly. It was commonly contrasted with license, the practice of abusing freedom by behaving immorally. From the dominant viewpoint of the secular Academy, appeals to religious truths are intrinsically illegitimate, which means that no educator has a moral right to make them in the classroom, and an institution committed to academic freedom has every moral right to prohibit them. It’s a comforting rationale. Let’s be clear: neither Christian nor secular institutions exalt unfettered academic freedom as their highest good or as an end in itself. This is because both claim to serve something larger, whether they speak in terms of “the public good” or of “Christ and His Kingdom” (goals that are hardly mutually exclusive, by the way). In pursuit of these greater goods, both Christian and secular schools establish boundaries within which they expect their faculty to operate. The main difference I see is that the secular Academy denies that it does so. After a lazy Sunday afternoon watching Peyton Manning strike a blow for old geezers, I’m feeling much too “do-less” (my grandmother’s word) to grade papers, so I thought I’d share some scattered thoughts about the recent American Historical Association annual meeting that I attended two weeks ago in Atlanta. The AHA is the premier professional organization for academic historians, and typically four to five thousand of us show up for each year’s conference. We’re a raucous bunch—not. Actually, think of every stereotype of historians that comes to mind and then double them, and you’ll be on the right track. I’ve never much enjoyed the AHA, to be honest. The sessions can be interesting, but as a concept they’ve never made sense to me. Believe it or not, historians read their professional conference papers word for word, which means that a typical AHA session involves a room of extraordinarily educated individuals (most of whom have PhDs) sitting around while someone reads to them. Given that we are literate, a cheaper and more efficient approach would be for all of the presenters to post their papers online. We could then read them at leisure from our laptops in coffee shops or while watching football on our couches, instead of having to travel across the country to have them read to us in a hotel conference room. But that would defeat the real purpose of these gatherings, which is all about connecting with people: reuniting with old friends, making new acquaintances, giving “elevator pitches,” talking to publishers, impressing potential employers, interviewing and being interviewed, seeing and being seen. What happens in the formal academic sessions—in conference rooms with names like “Salon West” or “Grand Ballroom D”—is not quite a sideshow, but it’s close. The real work is done in the numerous receptions and banquets, the book exhibit and the hotel bar. Which is another reason I’ve never much enjoyed the AHA. I hate to schmooze. I also hate the self-conscious isolation that comes with not schmoozing. Standing by myself in an academic reception reminds me too much of junior high (though without the fear of bodily harm). When our firstborn was fifteen months old, my wife and I traveled together to a historians’ convention in New Orleans and brought our daughter along. On the second night of the meeting, we stopped by a reception sponsored by my alma mater. The room was stuffy, loud, and crowded, with folks standing shoulder to shoulder, drinks and hors d’oeuvres in hand, while they shouted in each other’s ears about the historiographical contributions of their doctoral dissertations. In the hubbub our toddler managed to slip away from us, and I’ll never forget where we found her. She had somehow made her way through the forest of grown-up legs to the far side of the room. There she stood, pressed into the corner with her back to the crowd and her forehead against the wall. Many a time I’ve wanted to do the same thing. My discomfort at these meetings is more than just a matter of temperament, however—the lonely-in-a-crowd feeling that an introvert in such a setting should expect. It comes also from a sense of not wholly belonging, from the palpable tension that washes over me between the values of my profession and the demands of my vocation. Professionally, I’m a member of the guild of PhD’ed historians at work in the Academy. Vocationally, I’m called generally to be a Christ follower, and more particularly (I believe) to serve the Church by helping her learn from history and remember the past faithfully. My profession and my vocation aren’t blatantly at odds—I’d have to abandon my profession if they were—but neither are they wholly complementary. Where is mercy at the American Historical Association? What form does justice take in the job register? Who considers love in the array of bloodless panels at professional meetings? I take her basic point. Considered as a whole, Schweiger’s surely right that “the world of professional history does not reward charity or wisdom.” But that doesn’t prevent countless individuals from being agents of God’s grace amidst the striving for professional place and power. I know this for a fact, for I was the beneficiary at least a half dozen times in three days. The last three years have been a time of prolonged trial in the McKenzie family, and my wife and I are chronically weary and often discouraged as a result. The last thing that I expected was that the AHA would be a respite, a time of encouragement and refreshment, but that’s exactly what happened. It began on the second night of the conference with the opportunity to find a quiet corner in the Hilton and talk for an hour with a former student of mine. This young man is the complete package—great mind, exemplary character, extraordinary determination—and yet he’s encountered a series of roadblocks that have left him discouraged. We talked freely, and I had the privilege of reminding him of God’s faithfulness and love, and he responded with genuine concern for my family and for me. I left encouraged by his caring, and grateful for the opportunity to teach in a setting where connections of such depth develop frequently. The next morning was the breakfast reception of the Conference on Faith and History. Among several conversations that were uplifting, two stand out. First was the opportunity to talk with an older friend, a scholar of national reputation who, for reasons that I have never comprehended, has always jumped at the chance to help me whenever he can. He helped get me on my first professional panel twenty-six years ago, he’s given me feedback on manuscripts, and when I needed a professional reference when I was being considered for an opening at Wheaton, he wrote the longest letter of recommendation that I have ever laid eyes on, so laudatory that I could scarcely recognize the person he was writing about. Before we parted he reminded me that he prayed for my family regularly, and he asked for prayer for one of his grandchildren. I felt loved. Before leaving I sat down beside another friend of long-standing, mainly to pat his arm and say “hi” before he had to leave. At this point the breakfast was ending and most of the CFH members were scattering for various academic sessions, but this loving man asked me how I was and, what is more, he really wanted to know. We talked for an hour and a half in the empty dining room while the hotel staff set up for the next event. He encouraged me professionally, getting excited about my academic projects as I described them, reminding me that my labor was not in vain. He encouraged me personally, as we shared about our families and our hopes and concerns for our adult children. I left that conversation feeling affirmed, and encouraged, and loved. This litany will soon grow tedious unless I summarize. That afternoon I ran into a historian who has been praying for my family for the past couple of years, and I took the opportunity to share with him some of the ways that I see his prayers being answered. He wanted to hear more, and we talked and walked and shared for three quarters of an hour. By prior arrangement, I then met with the man who taught the very first college history class I ever sat in, when I was a seventeen-year-old freshman at the University of Tennessee. Thirty-eight years later, this man who inspired me to pursue an academic career wanted to connect with me. As we sat in the Marriott lobby he told me what he had seen in me nearly four decades ago, and then he trusted me enough to talk about the son who had returned from Afghanistan with PTSD, and the sense of helplessness and sorrow that had turned his own heart toward God. Finally, before catching the airport shuttle the next morning, I was able to grab breakfast with a wonderful historian who I’ve known since the 1990s. We hadn’t connected in several years, and after finding out how I was doing, he was transparent enough to share about a personal heartache as well as God’s subsequent kindness, and again I walked away encouraged. Does the historical profession, as a profession, reward wisdom and charity? No, it doesn’t, but I found instances of both this year at the AHA, along with encouragement and kindness and grace. May God alone be praised. 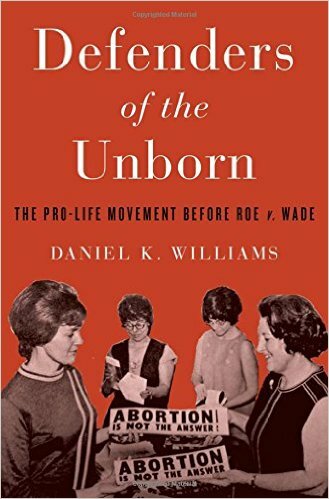 Some time ago I mentioned that I had written a review for Christianity Today of a new work of history that I can enthusiastically recommend, Daniel William’s Defenders of the Unborn: The Pro-Life Movement Before Roe v. Wade. My review, at last, is available online to all readers (no subscription to CT necessary). If you are interested, you can read the review here. Last week I asked for your prayers for Wheaton as the College seeks a resolution to the heart-wrenching controversy swirling around our colleague, Dr. Larycia Hawkins. Several of you have contacted me privately to say that you are praying, and speaking for the whole campus community, we are grateful. For now, the firestorm continues, exacerbated by an often misinformed media and by a cacophony of voices certain that they know exactly what has transpired and who is to blame. Some of the criticism directed at the college comes from concerned Christians who believe in Christian education but disagree with how the controversy over Dr. Hawkins’ public statements has been handled. Much of it, however, comes from secular critics who believe “Christian education” is an oxymoron. From this perspective, the current controversy merely highlights the utter incompatibility of academic freedom and Christian conviction. The vast majority of the professors Wheaton hires come either straight from a Ph.D. program at a major, secular school or from teaching at a secular university. Again and again they revel in the luxurious, newfound academic freedom that Wheaton has granted them: For the first time in their careers they can think aloud in the classroom about the meaning of life and the nature of the human condition without worrying about being accused of violating the separation of church and state or transgressing the taboo against allowing spiritual reflections to wander into a conversation about death or ethics or hope. My professional life has been framed by two very different institutions. For the first twenty-two years of my academic career, I taught at the University of Washington in Seattle. In many ways, my time there was a blessing. The UW is an elite academic institution with an extraordinary faculty and world-class resources. During my time there it boasted five Nobel Prize winners, one of the largest libraries in North America, and was ranked by the Economist as one of the top twenty public universities in the world. I also made several good friends at UW and benefited from a number of genuinely kind colleagues who took sincere interest in my wellbeing, both personal and professional. Finally, I should acknowledge that I flourished there professionally—in certain respects. I was awarded tenure, rose in rank from assistant to associate to full professor, won the university’s distinguished teaching award, and was accorded a prestigious endowed chair in U. S. history. That is eventually how I came to think of my time at UW. For all of its discrete strengths, the university is less than the sum of its parts. Like the secular academy overall, it is “hollow at its core,” to borrow the words of historian George Marsden. There is no common foundation, no cohering vision, no basis for meaningful unity. After twenty-two years of faculty meetings, I can attest to the truth that the faculty functioned best as a group when we avoided larger questions about our collective mission and purpose. As long as we could each do our own thing we were fine. When it came to matters of faith, the university’s unwritten policy was a variation of “don’t ask, don’t tell.” It celebrated racial and ethnic diversity relentlessly but was never all that enthusiastic about a genuine diversity of worldviews, at least among the faculty and in the curriculum. If you espoused a vague “spirituality” that made no demands on anyone–or better yet, seemed to reinforce the standard liberal positions of the political Left–all well and good. Otherwise, it was best to remember that religious belief was a private matter that was irrelevant to our teaching and our scholarship. For twenty-two years I accommodated my sense of calling to this secular dogma, bracketing my faith and limiting explicit Christian expressions and Christian reflections to private conversations with students who sought me out. In his book Let Your Life Speak: Listening to the Voice of Vocation, Parker Palmer writes movingly about the costs of such segmentation. Vocation is a calling to a way of life more than to a sphere of life. “Divided no more!” is Palmer’s rallying cry. If I were to characterize my experience since coming to Wheaton five and a half years ago, these are the words that first come to mind–divided no more. Wheaton is not a perfect place, nor did I expect it to be one when I came here. But I can honestly say that I have experienced much greater academic freedom at Wheaton than I ever did at the secular university that I left. One of the reasons to study the past is to see the present more clearly. By figuratively visiting other times and places, we become more aware of aspects of our place and time that we would otherwise take for granted. Last night’s State of the Union address is a case in point. The president’s State of the Union Address (or SOTU by POTUS for those who think acronyms are cool) is now an enormously significant media event with huge political ramifications for both parties. As the nation watches (to the degree that we watch), the president and his party enjoy millions of dollars’ worth of national publicity. The party’s leader pitches his policy proposals, while the camera pans to congressmen looking variously engaged or bored, gleeful or glum, enthusiastic or resentful. From first to last, this is a media-driven event. In advance of the spectacle you could tune in to any number of pre-game shows, not the least of which was sponsored by the president himself. Virtual visitors to the White House website were first reminded that “Together, we can make change happen.” You could then watch the SOTU “pre-show,” view video of everyday Americans as they received phone calls inviting them to sit with the First Lady in her box during the speech, and even read synopses of what the president planned to share regarding the economy, climate, health care, foreign policy and social progress. After the hour-plus speech, a smorgasbord of talking heads told us what the president said, why he said it, and what they thought of it, while pollsters scurried to ask us (or at least a few hundred of us) if we thought what the talking heads thought we should think. It has not always been this way. The Constitution doesn’t require the president to give a speech to the Congress, only to give it information and make recommendations. And for most of American history, U. S. presidents have opted to send a formal written report via messenger and skip the personal oration. Overall, since 1789 that’s been the case for nearly two thirds of these messages–only 82 out of 226 (about 36%) have come as speeches. Our first two presidents, Federalists George Washington and John Adams, appeared personally before Congress to satisfy their Constitutional duty. But between 1801 and 1913, not a single U. S. president followed their example. In 1801, Democratic-Republican Thomas Jefferson decided to send his message in writing to Congress on the grounds that the practice of lecturing Congress in person was undemocratic. 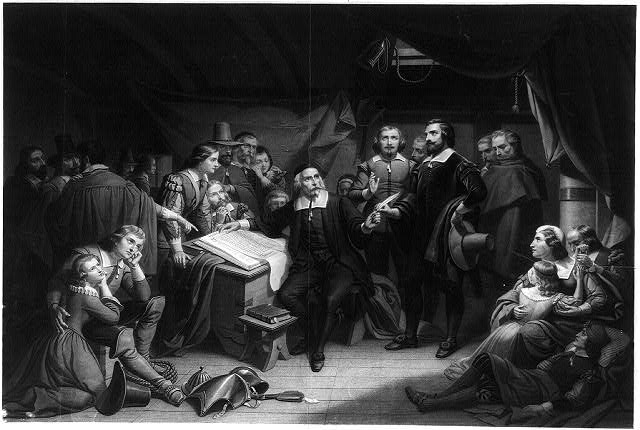 In England it was customary for the king to speak periodically “from on high” to the Parliament, and Jefferson–who hated public speaking anyway–insisted that a truly republican government should not be perpetuating the trappings of monarchy. From this point, the pattern began to shift slowly but surely toward personal appearances. In the process, what had once been a rather perfunctory summary of the work of the various executive departments gradually became a major political statement on behalf of the president and his party. More important, the originally intended audience of the address–the U. S. Congress–was replaced by the American public. The growing importance of radio and television was central to the latter transformation. The first president to deliver his address to a national radio audience was, ironically, “Silent” Cal Coolidge, who belied his nickname with a 22-page long speech in 1923. In 1947 television got into the act, broadcasting Harry Truman’s address to the fraction of American households who had invested in that dubious technology. The TV audience grew steadily thereafter, so that by the mid-1960s Lyndon Johnson decided to shift his speech from the traditional afternoon setting to the early evening in order to garner a much larger “prime-time” audience. Which brings us, more or less, to the highly choreographed, vacuous public spectacle that the State of the Union address has long since become. True to form, last night’s was a relentless rhythm of presidential statement and partisan response: Democratic ovations, Republican groans, Joe Biden repeatedly rising to his feet, Paul Ryan glued to his chair. 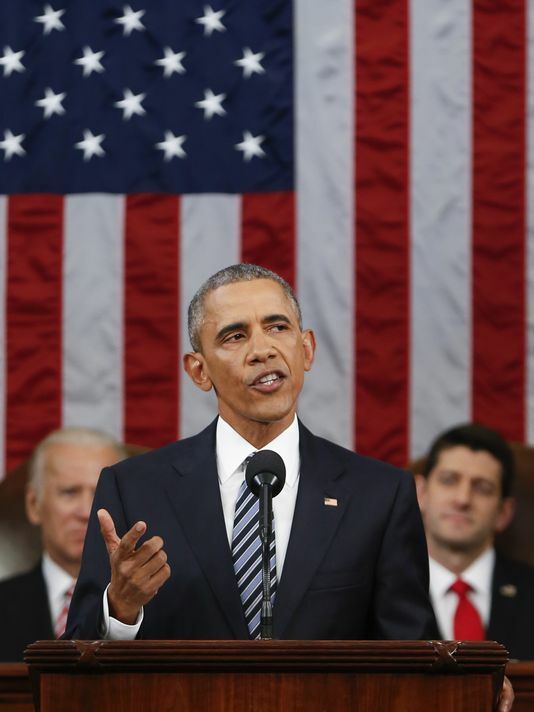 If the Washington Post transcript of the event is accurate, President Obama was interrupted by applause seventy-one times during his fifty-nine-minute speech. In sum, the event is now much like our quadrennial party conventions. Photo-ops, posturing, and platitudes abound, but almost no real work gets accomplished–at least not the kind of work that the framers of the Constitution envisioned. The only real suspense in the event came when, for a moment, it looked as if a drowsy Justice Ruth Bader Ginsberg was going to fall from her chair. I could sympathize. Does anyone else find this tedious? I have intentionally not commented on the uproar currently swirling around Wheaton College. Probably most of you are at least vaguely aware of the heart-wrenching controversy that has been unfolding since Wheaton faculty member Dr. Larycia Hawkins made statements interpreted by some as effectively equating Christianity and Islam. My purpose now is not to defend either Dr. Hawkins or the Wheaton College administration. Frankly, I don’t think I know nearly enough to speak confidently about the matter (and I am mystified by the cacophony of voices from across the country who claim to know exactly what’s going on and why). What I do know is that I love Wheaton College, and I grieve for both Dr. Hawkins and for our president and provost, all of whom have been subjected to vicious abuse online and in print. The faculty met this morning to pray that God would bring a glorious resolution to this crisis, and I would love for you to join with us. We are fallen individuals laboring in a fallen institution and acutely aware of our need for God’s wisdom and grace. In closing, let me recommend a recent piece by Bethel University’s Chris Gehrz who tries to think about the controversy in a broad historical context. Even more than Professor Gehrz’s thoughtful assessment, I was impressed by his even-handedness and touched by his closing exhortation. “Please try to show grace and empathy towards fellow evangelicals,” Gehrz urges.
. . . While I continue to think that Hawkins is being treated unfairly and unwisely by at least some of Wheaton’s administrators, I want to trust that what they’ve done is motivated not by anti-Muslim bigotry but by their commitment to take theology seriously, understanding that what we believe has implications for what we do.